In response to requests from their clients, Firm Foods is releasing a complete vitamin and mineral formula with the best cost-benefit ratio on the market! We know that vitamins and minerals play a crucial role in our bodies. 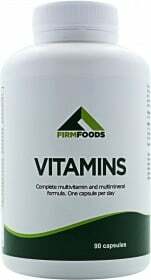 With 100% daily recommended allowance of the main vitamins, Vitamins from Firm Foods offers a complete formula with vitamins A, B complex, C, D and E and minerals such as Zinc and Calcium for improved body functioning as you encounter the challenges of daily life. With our busy schedules, it's difficult to carefully plan and choose our meals so that we get all the nutrients we need. Vitamins from Firm Foods plans on being the solution to that. Try their complete and effective formula today! Have a question about Vitamins? What is it, what does it do, how and when to use or something else? Ask us. As a dietary supplement, take 1 capsule per day, in the morning. WARNINGS Vitamins : Do not exceed recommended daily dosage! Keep out of reach of children. This product should not be used in case of hypersensitivity or allergy to any of its constituents. Food supplements should not be used as a substitute for a varied and balanced diet and healthy lifestyle. Store in a cool, dry place. Please Recycle. BEST BEFORE: Please see lot number and expiration date stamped on the packaging.